Welcome at Wire and Steel Trading nv ! "First in secondary steel wires"
Our core business since the foundation in 1996 is trading, storing and sales of secondary steel wire and wire products. Secondary, second choice, spot- and stocklots, surplus, overrollings, declassified STEEL WIRES : that is what we do best ! "First in secondary steel wires" is not just a slogan, Wire and Steel Trading NV is proud to be the market's leading stockist and trader of secondary/second choice steel wires. We buy secondary steel wires from all main drawing mills, worldwide. Our warehouse is located in the port of Antwerp, one of Europe major ports with departures and arrivals from and to nearly any destination in the world. 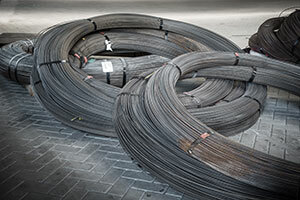 Secondary steel wire is a cost effective solution for alternative end-uses. Secondary brass coated tyre cord, secondary galvanized belt cord, secondary brass coated hose wire, secondary bronze coated bead wire. Secondary low carbon galvanized and non galvanized (bright) steel wire, soft, halfhard, hard. Discover our detailed product-range by browsing on our product details.